Discussion area for watch straps, boxes, winders and other accessories. I have this watch and I am looking to replace the strap. It has a 23mm lug width so there isn't much out there for "standard" straps to use for it. Has anyone had luck with trimming or "sanding" down a 24mm leather strap to make one fit? I have a 22mm strap in it now, but I hate the gap and worry about it falling out while wearing the watch. Just trying to avoid going the "custom" route to save a little money. WatchGecko has their Old Chester leather strap that is 23mm and on sale for $23 in a few colorways. 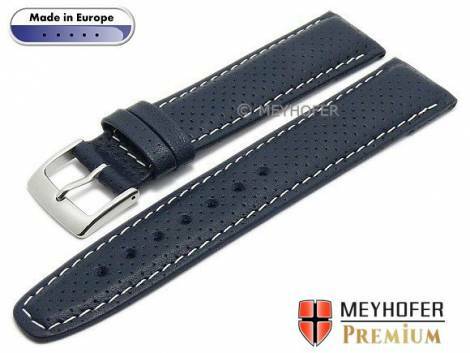 And Watch Band Center has this Meyhofer "Trient" 23mm dark blue leather perforated light stitching for roughly $32, if I'm doing the conversion correctly. Thanks for the heads up, I wasn't having much luck finding a 23mm strap. Have you ever tried one of their stainless steel mesh straps? I have been kicking around the idea of trying one and I'm curious if Watch Gecko is a decent brand. I have ordered a number of WatchGecko straps and have never had an issue. Other than they ship it without tracking, so seems to take forever to receive from the UK. I can be impatient waiting for the package to arrive without tracking! They also make good watches too. I wouldn't have any reservation about ordering from them again. Unfortunately, they don't have any stainless straps in 23mm, if you were looking to put the Blue Angel on one. I've never ordered from them, but I believe plenty of others have gone there to get OEM bracelets for the Citizen "Prime" diver's watches (BN0150/BN0151).